From Stopsley Leisure Centre, Luton. The competition combines powerlifting and Olympic weightlifting skills/events. Features the European powerlifting champion Andy Kerr. Strongman Bill Kazmaier competes in the deadlift event at the Strongbow World Superman Contest in Woking, England, in February 1981. 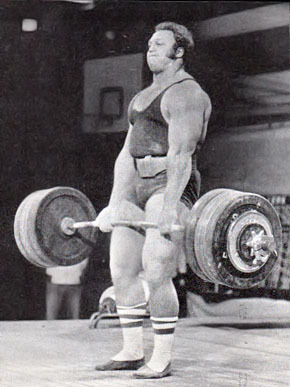 Kazmaier won the competition, which featured the deadlift, the jerk, and overhead dumbbell presses. kaz pressed the 121 dumbbbells 17 times . did a god clean and jerk and deadlifted 837 pounds .